Jason Sterlacci has wanted to be on Jeopardy for as long as he can remember. 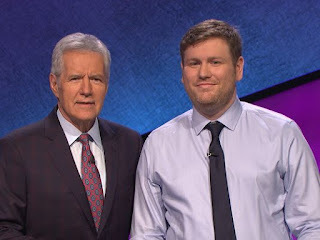 Like many of us, he tuned into the show and tried to answer the questions before the contestants did, and thought about what he’d say to Alex Trebek if he got a chance to appear on the Jeopardy stage. Fortunately, Jason is braver than many of us, and when the chance to appear on Jeopardy’s Teacher Tournament came along, he seized the opportunity. We caught up with Jason and he filled us in on his experience on the show and what it was like to meet the man who’s been hosting Jeopardy for nearly Jason’s entire life. Less Than Reality: Thank you for agreeing to chat with us! What made you decide to take the plunge and apply to be on Jeopardy’s Teacher Tournament? Sterlacci: It’s been a dream of mine to be on Jeopardy! Ever since I started watching. I didn’t actually apply for the Teachers Tournament, though; everyone who got selected for the Teachers Tournament was a part of the regular contestant pool and was qualified to appear on regular episodes. Photo - Courtesy of Jeopardy Productions Inc.
Less Than Reality: Walk us through the process of becoming a Jeopardy contestant – what kind of tests did you have to take? Were there rehearsals? What was the overall experience? Sterlacci: Like every other contestant, I had to start with the online test. I took the test that ultimately got me on the show back in January of 2014, and while they don’t tell you the score you need to make it to the next stage, I apparently met that threshold. This was my fifth or sixth time taking the test though. A few months later I was contacted via e-mail to appear at an in person audition in Philadelphia. While I was there, I had to take a 50 question written test (with 8 seconds per question), play a simulated game, and do an interview. I was in the contestant pool for a little over a year before I got the call. As for rehearsals, before both the first and second rounds, each contestant played in some simulated mini-games to get a feel for the buzzer and the timing. That was actually pretty nerve-wracking itself, as it turns out the timing on the buzzer is really difficult to get down! Less Than Reality: What was your favorite part of appearing on the show? Sterlacci: I got to meet a bunch of amazing teachers from across the country; the fifteen of us have really bonded and kept in touch online now that the tournament is over, and it’s great having colleagues and friends who have shared this experience with me. Less Than Reality: Onstage, Alex Trebek always looks so calm and composed. Is this what you experienced on the Jeopardy set? Sterlacci: Alex is pretty relaxed, honestly. During commercials, he takes questions from the audience and while it seems like it’s the same six or seven questions over and over again, he’s always happy to talk about his experiences and his opinions in a friendly, funny way. Less Than Reality: If anything, what were you most nervous about before your appearance on Jeopardy? Sterlacci: As I mentioned, the buzzer timing is really difficult to get down. For most of the practice game before the quarterfinals, I had difficulty ringing in. That translated into a decent portion of the first round as well. Less Than Reality: You were calm and collected the whole time. How did you do that on such a high pressure situation? Sterlacci: Was I? I didn’t feel calm and collected for the first round! My students pointed out that I was violently trying to buzz in well into the first round. However, once I finally got the timing down, a lot of my nerves did go away. Less Than Reality: Congratulations! You won! How does it feel? What's next? Sterlacci: Thanks for the congratulations! It’s surreal, though it’s pretty cool that people have gotten the chance to see it. As for what’s next, my semi-final game is going to be Wednesday. Less Than Reality: Now that your episode has aired, how do you feel? Is there anything you’d do differently? Sterlacci: I think I’d re-work my wagers on the last Daily Double and Final Jeopardy! It turns out there’s a pretty big online community for Jeopardy! and a lot of people gave me a very hard time about my wagers for both of those. I’ve actually recently discovered a blog about Jeopardy! betting and I wish I had known it existed when I was in LA. Less Than Reality: Do you have any advice for potential Jeopardy contestants? Sterlacci: Keep trying to get on...it took me a couple of tries to get an in-person audition, and there were people at my in-person audition that were on their sixth or seventh attempt – and it just so happens that some of them did get on the show. Also, if you DO get the call, practice buzzing in by using a springed toilet paper holder. Less Than Reality: Is there anything else you’d like to share? Sterlacci: Thanks for watching, and thanks for taking the time to set up this interview! Again, we thank Jason for sharing his experience with us, and we think this New Jersey native made us proud with his appearance on Jeopardy. It’s also important that we thank Jason for being a teacher. His commitment to his students is evident, and he is proving not only through his work in the classroom, but also by example, that education is important and can lead to many opportunities. Jason, thank you for your commitment to America’s youth, and we wish you all the best. Update: Jason won the whole tournament! We'll see him in the Tournament of Champions!